Last week, a friend came from out of town to have dinner with me, so I was left with the always daunting task of deciding where to dine. 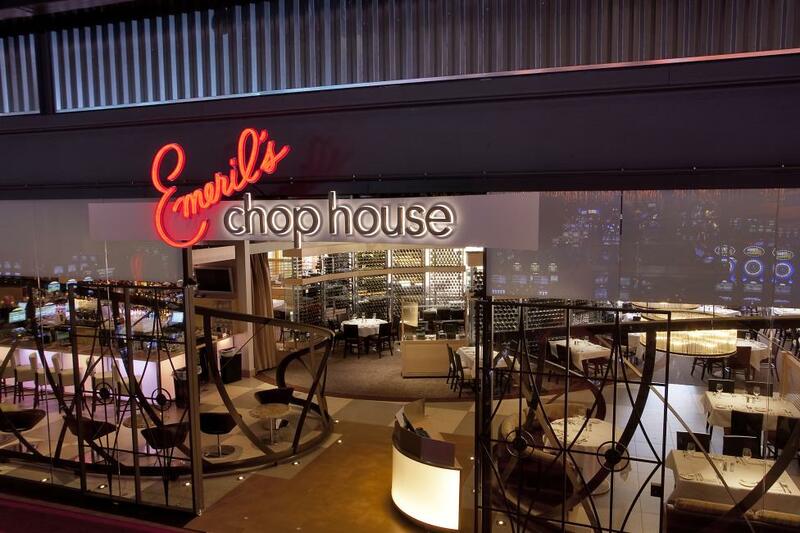 I was in the mood for steak, so I figured: what better way to show off Lehigh Valley than to dine at Emeril’s Chop House in the Sands Casino? We started off with the Poached Jumbo Gulf Shrimp as an appetizer. The shrimp were huge and accompanied by delicious sauces for dipping. I was particularly fond of the Louisiana-style remoulade sauce that Emeril Lagasse is known for. I got the 6 oz. Filet Mignon “Dressed Up” with roasted garlic mashed potatoes, asparagus sauté, and bordelaise sauce. They also put out three additional house-made sauces on the table including Worcestershire, creamy horseradish, and béarnaise. This was easily one of the best steaks I’ve ever had in my entire life. Since I was getting over the flu, I opted to get my steak cooked medium well, but it was still succulent and juicy. The steak was so tender, and melted in my mouth with each bite. I’m not a fan of steak that is drenched in butter or cheap steak sauce, so the house-made sauces were a very nice accompaniment. I was particularly fond of the Worcestershire sauce, although all them were excellent. My friend also ordered the same entrée, but got Day Boat Scallops on the side instead. The scallops were to die for – huge, meaty and grilled to perfection. We were so full after our dinner was finished that we chose to forego dessert. Our waitress, however, overheard that we were celebrating a special occasion and brought us a complimentary ice cream dessert. It was a nice touch that got her a very nice tip! I have tried their desserts before though, and they are all very good. I remember being particularly fond of their chocolate covered Bread Pudding from the last time I dined there. Dining at Emeril’s Chop House is not easy on the wallet, but that’s to be expected from a celebrity chef like Emeril Lagasse. The restaurant is upscale and has a beautiful calming ambiance, so much so that it&apos;s easy to forget you’re inside a bright, bustling casino! I managed to thoroughly impress my dinner guest, who so wrongly assumed that all the Lehigh Valley dining scene had to offer would be typical suburban chain restaurants. What&apos;s your favorite upscale restaurant in Lehigh Valley?